The ALR Post 259 club is based out of Oneonta, NY. ​Thank you for checking out our website and coming to what will be our blog section. We will be posting content here regularly about topics about the club, the American Legion and motorcycles. Be sure you have joined our mailing list to get notifications! Riding a Motorcycle with your Dog! Chris is a hopeless Technology Fanatic, an Inbound & Outbound Marketing Expert as well as an Senior IT Advisor, Web, Graphics & Software Designer. 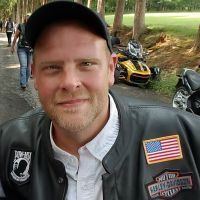 When he's not running Directive and JoomConnect he's probably riding his motorcycle or sharpening his skills as an Amateur Photographer and Filmmaker. Chris lives with his wife Charlotte and their 2 sons in Upstate NY. Visit his photography site at www.directivestudios.com. Tuesday, 19 March 2019 Spring is here! Get Road Ready with These Tips! Monday, 27 August 2018 Riding a Motorcycle with your Dog! Subscribe for the lastest updates!